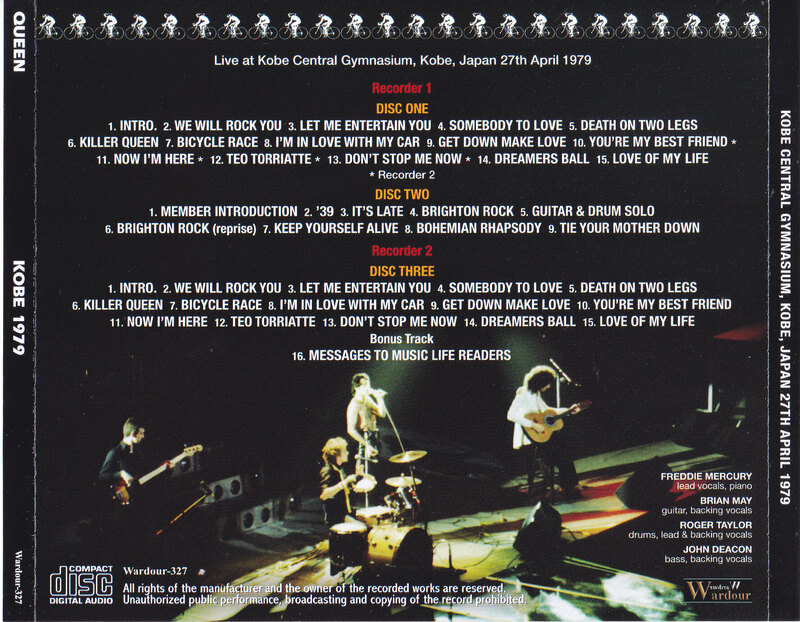 Recorded: Live at Kobe Central Gymnasium, Kobe, Japan 27th April 1979. Comments: From the Japanese 'Jazz' tour. 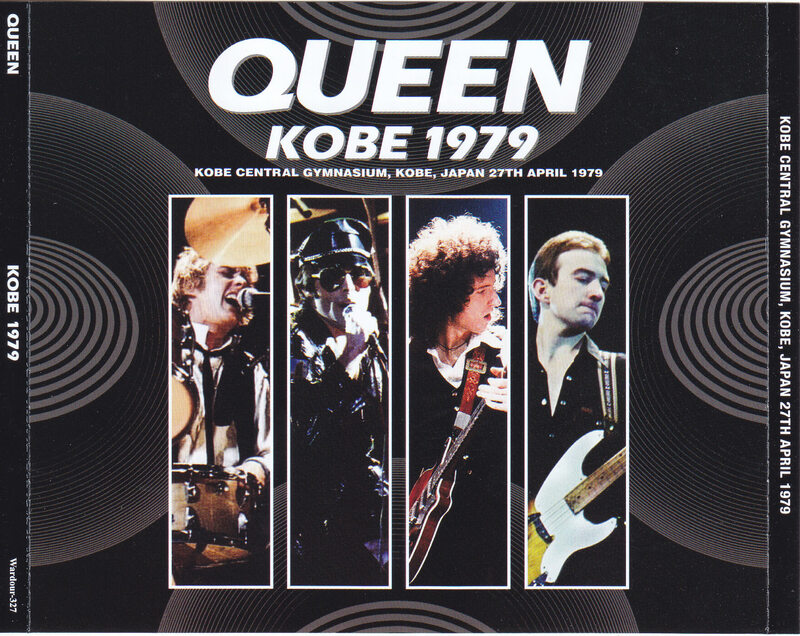 Queen – Kobe 1979 is a triple disc featuring two recordings from Kobe Central Gymnasium, Kobe, Japan on April 27th, 1979. Recorder 2 is used to patch a four song gap in the middle of the first source (Discs one and two) while Disc three contains the incomplete second source. Unfortunately, neither source contains the final four tracks. * Recorder 2, Tracks 10-13 on disc 1, Not recorded on the original tapes by Recorder 1, so the tracks were patched using Recorder 2's recording. While "YAMAGUCHI 1979 (Wardour-325)" and "LYON 1979 (Wardour-326)" are not even shocked, a live album of further tremors has been newly excavated. It is the world premiere with permanent preservation press 3CD! Contained in the tremor is "April 27, 1979: Kobe Central Gymnasium" performances. The same as "YAMAGUCHI 1979" released the other day, it is an audience recording that recorded the Japanese performance of "JAZZ TOUR". However, the impact is even greater than that of YAMAGUCHI 1979. Although Yamaguchi shows have been kept secret, their existence is known, and there are also core collectors who have been surveyed. However, this Kobe performance is different. Although there is a collector who says only a word "exist", its contents are unknown at all. (I guess I haven't heard about it) I don't know the sound quality or even the number of minutes of recordings. It just existed in the rumor. Such a half fantasy recording really existed. What's more, this album is a live album that includes all of the two audience masters. It is the first appearance sound source that shakes QUEEN mania around the world. Before the details, the show position first. Together with the collections we have introduced in our shop, let's check on the schedule. As mentioned above, this work is recorded two records of the Kobe performance. However, its configuration is a bit complicated. Disc 1-2 is a long live album that makes full use of two masters, and disc 3 contains all the short "RECORDER 2". Why is this configured? Let's go ahead and introduce each one. First to appear is a live album that reproduces the show with 2 recordings. It was recorded from the opening to the final "Tie Your Mother Down" of the main part set, and unfortunately two encore parts were not recorded either. The main thing is "RECORDER 1" of long recording. However, the recording has stopped in the middle although this is a long-length, 4 songs "You're My Best Friend" "Now I'm Here" "Teo Torriatte" "Don't Stop Me Now" Was not recorded. The part is complemented by short recording "RECORDER 2". If you do not know anything, the sound quality changes in the middle part, but this is not a replacement due to the quality of the recording, but a complement to the part of the recording omission. The point of this disc 1-2 is the wonder of long recording "RECORDER 1". It is a monaural recording, and distortion is felt at the time of the performance, and I think, "I'm thankful only you can listen ...", but when "We Will Rock You" flows out, giving up changes to pleasure. The sound is clear and clear is improved with the gun. Moreover, the sound of the performance is boney! Of course, it's not a type that makes a mistake with the sound board, but it's a vintage audience, but the core without a sense of distance still approaches the front with giggle just as it is detailed. Still there is still sound shaking, but it also improves as the show goes on, and it hardly gets in the way when it enters the third song "Somebody To Love". This work is the impact of the world's first appearance is the importance, but it is a wonderful sound to forget even that. However, the shock of the world first appearance is intense too. I remember again that Freddie's words after "We Will Rock You" say, "Good evening. How are you. We are glad to come back to Kobe." I strongly feel the weight of the recording in Japanese called "Kobe" clearly. Furthermore, after "Let Me Entertain You", Brian says, "How are you? It will be for a while. Five or five years, OK." This "five years" is said to be about the Kobe performance of the first visit to Japan. It is actually four years ago, but the pronunciation of "Yonen" and "Gonen" is subtle and has become "On". It is a sound that can be understood clearly until such a subtle pronunciation. Following such a long live album is a panoramic view of "RECORDER 2". This was recorded for 60 minutes from the opening to "Love Of My Life". The above-mentioned Disc 1-2 is also used for four songs for compensation, but this is a valuable new excavation. This work is permanently saving all of them. The “RECORDER 2” is also a great vintage audience. Although I am giving up to "RECORDER 1" for clearness and tightness, I am glad that this is stereo recording. Of course, it's not a sound board, so there is nothing like playing around, but you can feel the three-dimensional feeling and reality of the acupuncture that spreads in the Kobe Central Gymnasium. And a sense of stability. Although "RECORDER 1" is improving gradually, there was a sound fluctuation, but here it is stable. At the beginning of "Don't Stop Me Now", although another overwrite recording is inserted for only a moment (about 1 second), other than that, it is possible to soak in the scene of the world premiere. And all the music that I hear for the first time is everything from the one song to the one phrase drawn in the sound. It is important to even the places that can not be heard conversely, "If You Can't Beat Them", which I showed in Osaka on the second day of Osaka and the next day, did not play in Kobe again. Music that was not more than a rumor of existence, including such facts, notes that the world knows for the first time continue endlessly. It is a live album of shock. Such a disk 3 has one bonus track recorded at the end. This is not a performance, but a message or comment for readers who were recorded in a music magazine interview. Only four people speak one word at a time, but the voice is really youthful. This alone is a valuable sound source that feels the weight of 40 years. Disc 1-2 that can listen to most of the show over about 102 minutes, with "RECORDER 1" as the main. And disk 3 which recorded "RECORDER 2" excavated at the same time completely. Both are new excavation masters of the shock that the world knows for the first time. A new treasure that appeared in 2019, 40 years from the scene of "JAZZ TOUR". Please enjoy yourself with the permanent storage press 3CD. ★ 1979 Kobe Central Gymnasium performances first appearance Super rare over Yamaguchi. Includes 2 existing sources.